﻿Enns The author of any novel has a vital role in the portrayal of his subject to the audience. Author Jon Krakauer is no exception to this principle. In his 1996 novel Into the Wild, Krakauer masterfully manipulates the elements of rhetoric in order to convince his audience that his subject, the elusive Chris McCandless, was not merely a crazy, arrogant and ignorant kid and that McCandless? quest for truth in the wild is the same quest that every man goes through. Krakauer writes under the assumption that the majority of his audience has a negative perception of McCandless, seeing him to be one of the ?others,? a category of crazy adventures whose suicidal predispositions lead them to meet their fate in the wild. Krakauer contradicts this through the use of different rhetorical appeals- to logos, pathos, and ethos. He uses emotions and logic in order to prove to the audience that no, Chris McCandless was not who the audience believed him to be and that there is much, much more to the story than a single gravestone in the Alaskan wilderness. The most obvious rhetorical appeal in this novel is Krakauer?s appeal to logos, which he establishes through the use of factual evidence. When describing McCandless? family history and past achievements, Krakauer notes that ?? Chris graduated from Emory University in Atlanta, where he?d been a columnist for, and editor of, the student newspaper, The Emory Wheel, and had distinguished himself as a history and anthropology major with a 3.72 grade-point-average? (20). ...read more. I climb?? (133). 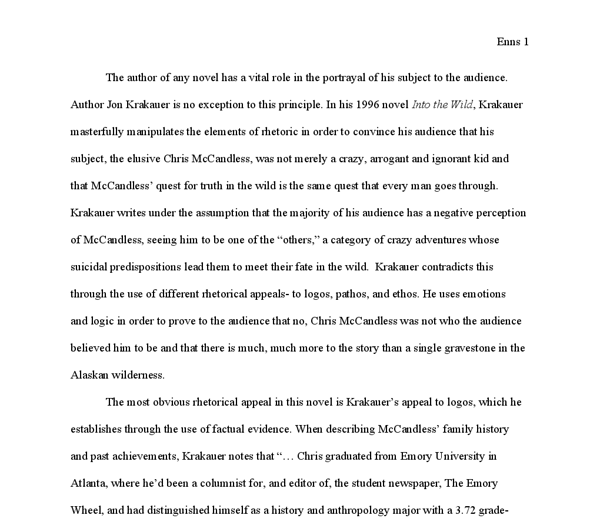 Prior to reading Krakauer?s account of McCandless?s life, the audience has already made the judgment that McCandless is a part of the ambiguous ?other,? a group of people that aren?t a part of ?normal? society and therefore cannot be identified with. The only possible explanation they could find for McCandless?s actions was that he was not right in the head, not an able member of society. However, through the use of this quote, Krakauer connects emotionally with the audience with their need to find a different, more intense existence in life. Menlove?s outlet to his ?craving mind? was to climb, just the same as Krakauer?s solution was to climb the Stikine Ice Cap and McCandless? was to escape into the wilderness. All the quotes in the beginning of each chapter are dramatic in the sense that they each consist of a universal theme; this quote in particular ties to the theme of a search for truth. A second strategy in creating an appeal to pathos is Krakauer?s use of individual stories in order to ?paint a picture? for the audience. Krakauer, devotes an entire chapter in telling the story of another individual, Everett Ruess, in which he proclaims ? ?Everett Ruess?s correspondence reveals uncanny parallels between Ruess and Chris McCandless? [An excerpt from Ruess?s letter]?I have always been unsatisfied with life as most people live it. Always I wanted to live more intensely and richly?? (91). Both young and both ?called to the wild,? Ruess and McCandless share a similar story in which they essentially abandon their family?s expectations and make their way solo into the wild, with little more than the clothes on their back and essential supplies. ...read more. Likewise, Krakauer?s concluding statement in his side of the story offers a conclusion drawn upon personal experiences, where he testifies ?The hint of what was concealed in those shadows terrified me, but I caught something in the glimpse, some forbidden and elemental riddle? In my case- and, I believe, in the case of Chris McCandless- that was a very different thing from wanting to die? (156). Both Krakauer and McCandless were in search for something in the wild, something to bring them closer to the ultimate truth in their own lives. Krakauer draws his argument that McCandless was not ?crazy? from the fact that Krakauer himself was not; Krakauer sees McCandless as a continuation of Krakauer?s own desires and one of the desires was not to die. 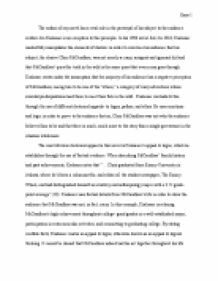 Krakauer?s manipulation of the three rhetorical appeals serves to convince the audience that the young Chris McCandless had many attributes and qualities that much of the audience overlooks in their evaluation of him and his Alaskan ordeals. Krakauer intertwines appeals to logos, pathos, and ethos throughout Into the Wild with such delicacy that the audience is unable to put down the novel without being fully convinced of the depth and elusive nature of McCandless? character. He recognizes in writing the story of Chris McCandless that a majority of society already has a negative perception of McCandless, one built from misinformation and perhaps even fear. As best summarized by Romain Dial at the end of the account, ? ?And I?m sure there are plenty of Alaskans who had a lot in common with McCandless... Which is why they?re so hard on him. Maybe McCandless reminded them too much of their former selves?? (186). ...read more. This student written piece of work is one of many that can be found in our AS and A Level Language: Context, Genre & Frameworks section. This is a beautifully written, logically argued essay which focuses on the author's intentions and analyses the probable reaction of the reader. This is an excellent essay - thoughtful and detailed which shows a real understanding of the subtleties of the author's craft. As the congregation repeats the prayers, Elie's anger at what he sees as God's betrayal becomes more intense: " 'But these men here, whom You have betrayed, whom You have allowed to be tortured, butchered, gassed, burned, what do they do? However, it also states that "Soup and sweets are done by the hostess". This implies that soup and sweets require smaller 'manpower' and that they would be easier to inevitably serve at the meal, as they do not involve cutting meat with knives or other sharp objects which could pose a threat. Both use very little figurative language at all, which is surprising. In Beowulf there is a simile, describing Grendel. ''From his eyes shot a light in unlovely form of fire''. Both, though, use very descriptive words and give a visual picture. Like in Beowulf when Grendel is eating his victims. Although Laurier's compromise didn't please both groups, he didn't force any Canadians to go to war and once again he was forced to make a compromise once the Naval Issue came up. How does E.M. Forster represent the English Character? This shows the hypocriticalness of the typical English man as he wishes o better himself but the poorer people are not allowed to. There is a strong contrast between the Italians and the English in their outward show of affection as the English are prevented by class. He shares his youthful energy with the audience by encouraging change all around the world for better, which is only possible through the spread of democratic ideals. By making references to the founding fathers of America and using diction such as ?freedom? ?liberty? ?renewal? and ?heirs of the first revolution?